A Toronto resident who says she was horrified to see a "racist" poster on a pole while walking to her children's school on Monday is blaming it partly on Donald Trump's victory in the U.S. presidential election last week. A Toronto resident who says she was horrified to see a racist poster on a pole while walking to her children's school on Monday is blaming it partly on Donald Trump's victory in the U.S. presidential election last week. They begin "Hey, white person," and invite readers to "join the alt-right." The posters also list websites that promise to provide news from a "pro-European" perspective. "It is racist. All cultures should be respected. That's just the way it is," said Penny Harker. "I think they're up because … of the Trump thing. I think he's filled everybody's heads with this on immigration." Police officers and city workers were on the scene Monday removing the posters, a task made more difficult because some were glued, rather than simply taped, to the utility poles. 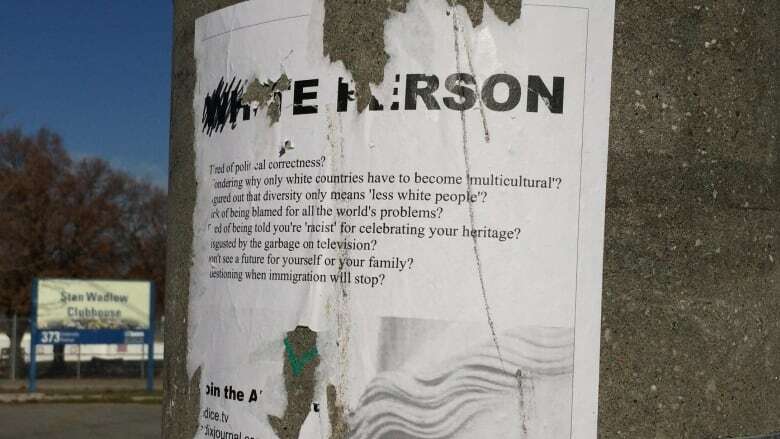 Rinaldo Walcott, director of the Women and Gender Studies Institute at the University of Toronto, said in an email to CBC Toronto that he felt the timing of the posters was no accident. "Of course the American election has emboldened white nationalist groups in Toronto," he wrote. "Only time will tell how far out of the shadows they will emerge."